!Update! 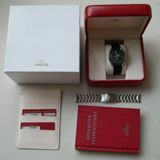 – Omega box sold, Omega Seamaster Chronograph sold, only few Panerai straps left! Not really ofcourse, but I decided to get rid of these two watches because they get no wear at all. 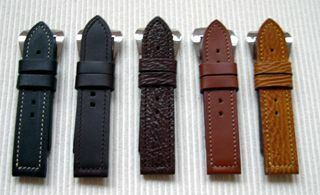 Also, I have some Panerai (or other 24mm ‘lugged’ watches) straps for sale. Brand new, never worn and including the pre-Vendome style buckle. See below… or click here to go directly to my special For Sale page with all this ‘attic’ stuff. That’s also the place where you will find more detailed descriptions and prices! 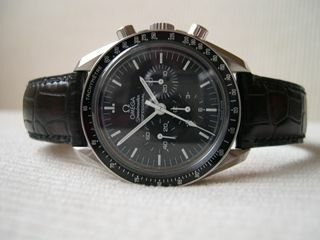 This Omega Speedmaster Professional ref. 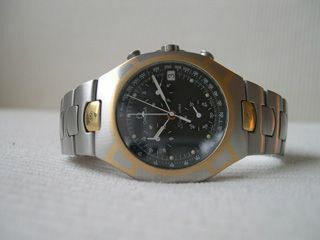 3753.50, comes with original strap and deployant buckle (latest model, with the pushbuttons) and the original stainless steel bracelet. Complete with box, papers and warrantycard (stamped 17th of January 2004). This is the model with the saphire crystal instead of the Hesalite crystal. Also a saphire crystal on the back, to see the cal.1863 movement. Also for sale… straps and a Omega wooden watchbox. Click here to see my For Sale page!! !